Reminiscent of Bob Dylan and Bruges lace, this dainty silver heart reminds us of the strength and fragility of love as its tendrils weave through our souls. 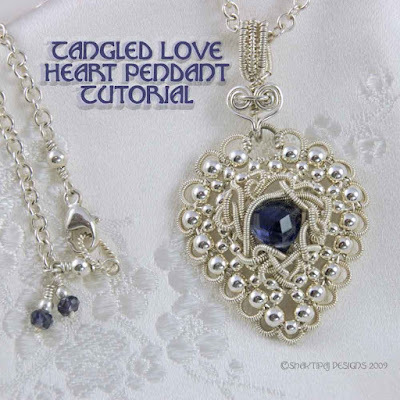 This tutorial includes detailed, comprehensive instructions and 78 photos for completion of this lovely heart. The basic elements of free form design are outlined. You will learn to construct a unique and versatile base adapted to wire from traditional beading techniques. Instructions for the bail are included, along with ideas for variations! SUITABLE FOR ADVANCED AND ADVANCED INTERMEDIATE WIREWORKERS.